Warning: I rescued a youngster from the grass verge about 10 days ago and he had a good week until Saturday when I found him dead and covered in maggots. I should have taken him for treatment as soon as I found him - didn't realise flies/eggs can so easily kill them. Maggots are an absolute nightmare at this time of year & we have treated loads lately which have been brought in covered in fly eggs or maggots. 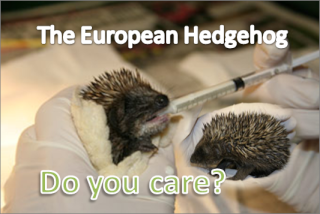 All hedgehogs have to be thoroughly checked & any eggs or maggots removed. Yes, I've had this problem too. They get in to any wound or any tiny cut, and once that happens, unless the Hedgehog has special treatment, the chances are it will die, sadly.